What is Thyme Oil ? 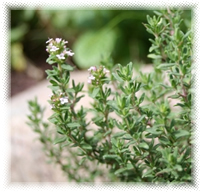 Thyme essential oil is steam distilled from the flowering herbal plant. It has a spicy, herbaceous aroma that is highly fragrant and the oil is considered to be a powerful one. If it is Red Thyme, its color is varying degrees of red, orange, and brown. It is best used in diffusers and not on the skin. If it is White or Common Thyme, it is clear in color, and has been re-distilled from the red thyme. The white is not as strong as the red, but still needs to be diluted. Thyme essential oil is used to help fight infections and is a good expectorant and cough suppressant. It has many other properties such as being an anti-inflammatory, parasiticide, and antifungal, plus numerous more. It has many uses ranging from gum infections, sprains, to insect bites, and is a strong antiseptic. It blends well with eucalyptus, cypress, clary sage, geranium, cedarwood, sweet marjoram, rosemary, lavender, bergamot, and the other citrus oils. For cold and flu seasons, add Thyme in this powerful and versatile germ killing blend, whether used in an aroma lamp, mister, or added to household cleaners for surface cleaning. The essential oil should never be applied undiluted and is not suitable for use in pregnant women and small children. Use with caution as it can be very irritating to skin. Thyme tea will settle the stomach, help you sleep, soothe a sore throat, relieve aches and pains, and encourage your body to sweat, helping to eliminate toxins and bring down a fever. Botanical Information - Rituals & History : Thyme is a perennial herbaceous shrub that grows to two feet high, producing white or purple flowers, and small green leaves with a grayish tint that are aromatic. Being an aromatic culinary herb, it is often used in the kitchen and in teas.